I led the music at my church this past weekend. That doesn’t always happen, whether live or in the studio. People focus so much on having “separation” in their mixes, but I don’t think that’s nearly as important as creating ONE sound out of all the tracks. When I eat a piece of cake, I really don’t want to taste the egg and flour separately. I want it to taste like cake. It’s the same with mixing. While you do need to address the individual tracks, the ultimate goal is to combine them together in such a way that creates a single “moment” of music. My latest mix is a great example of this. It’s one of the songs from my upcoming album. 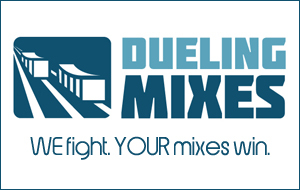 We’re mixing it next month over at Dueling Mixes. It has a lot of tracks, but when you combine them in the right way, they just sound huge. They fit together like a puzzle. If you’re not a member of Dueling Mixes yet, check out this HSC-exclusive “Sneak Peek” video I put together for you.